Over the weekend, encouraged by good feedback on my designer rosary beads, I set up and opened an Artfire store online to make some of them available for purchase. 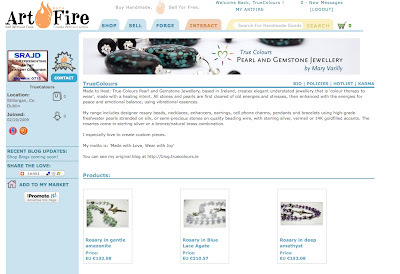 I used the banner my wonderful son Stephen had made me for a planned Etsy shop, but I get the impression that Artfire is much more user-friendly for non-geeks like me. They have a number of features I really like, among them there is space to write about what inspired the making of a particular product. They actually give scope to would-be authors like me who love to tell stories and love to write. Some Showcase buyers were very drawn to my designer rosary beads. I have to say, I LOVE planning and making them. It is fun to source and select stunning, beautifully crafted crucifixes, then match up colours, materials and shapes in a pleasing arrangement. And the hand-chaining is a restful, meditative activity. 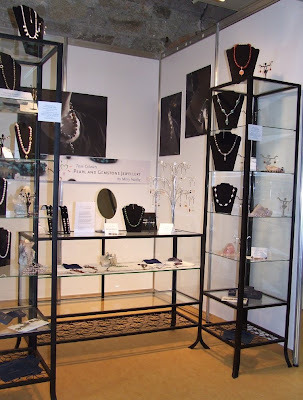 The range of crucifixes I use can be ordered in bronze or in silver, giving great flexibility of design and of budget. The first picture shows a range of 6mm stones I have chained on silver, any of which could be selected for a bespoke rosary. The stones, left to right, are African amazonite, deep amethyst, black onyx, blue lace agate, cape amethyst, carnelian, garnet, howlite, labradorite, peach moonstone, phrenite, sodalite, smoky quartz, African yellow opal, white agate. 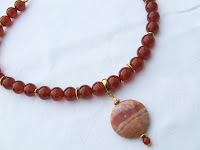 Tiger eye is a popular choice for men. The striking 6mm carnelian rosary has a sterling silver copy of a wooden Irish penal cross dating back to 1722. Penal Crosses typically had short arms as they were held in the palm for concealment because of the religious persecution of the times and longer arms tended to break off. 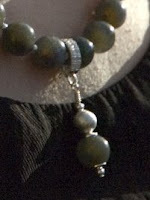 They tended to be one-decade beads, with a ring to slip from finger to finger to keep track of the decade being said. With it I put a centre in an early twentieth century design, I think it suits it well. 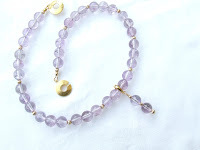 The violet rosary drew much admiration: the beads are 6mm A grade deep amethyst, paters have natural brass bead caps and the whole is handchained with natural brass, which seems to enhance the amethyst, though this stone is also lovely with silver. The bronze crucifix is an elegantly simple reminder of the Celtic cross shape, the centre a modest rose. 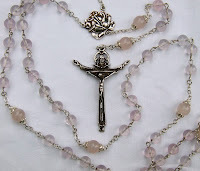 The pink rosary is made in 7mm Madagascar Rose Quartz which is particularly translucent and fine in vibration. I have paired that stone with a large sterling silver crucifix and sumptuous large rose centre, and handchained it all on sterling silver wire. The crucifix is based on an Italian 'Trinity' pattern and depicts Father overlighting the scene, with the Holy Spirit in dove form above the head of Jesus. The pater nosters are in a larger MRQ stone and I have emphasised them further using silver bead caps. The brown rosary has a striking bronze crucifixion scene, with Mary and John at the foot of the cross. 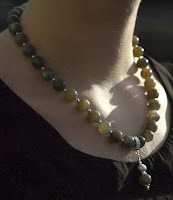 The stone is 6mm A grade smoky quartz, with faceted 8mm paters. They are handchained with natural brass wire and chain. 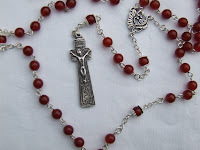 Just a sample of my beloved designer rosary beads!